Koszalin, Poland - October 07, 2014: Close-up shot of iPhone 6 hand-held by woman on white background. Devices displaying the applications on the home screen. iPhone 6 (4.7 inches) is next generation smartphone from Apple. Device displaying the applications on the home screen. Demand for smartphones is highly cyclical and related to the release of new models (photo: iStock by GettyImages). Over a decade of spectacular growth, demand for smartphones has created a new global tech cycle that last year produced a new smartphone for every fifth person on earth. This has created a complex and evolving supply chain across Asia, changing the export and growth performance of several countries. While our recent analysis of Chinese smartphone exports suggests that the global market may be saturated, demand for other electronics continues to support rising semiconductor production in Asia. Smartphones have become a key metric of global trade. In 2016, global smartphone sales reached almost 1.5 billion units. Smartphones have become the main computing platform for many people around the world, supplanting personal computers. 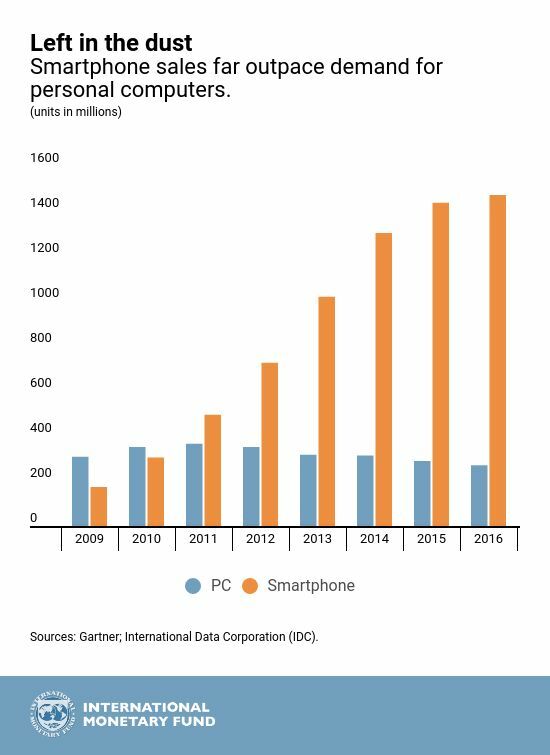 As the figure shows, demand for smartphones has surged while sales of PCs have declined. This shift has led to the creation of intricate and dynamic electronics supply chains in Asia. In 2016, China exported $107 billion of smartphones to the rest of the world, equivalent to 5 percent of the nation’s total exports. In South Korea, the main supplier of smartphone components, semiconductor exports were 17 percent of total exports. 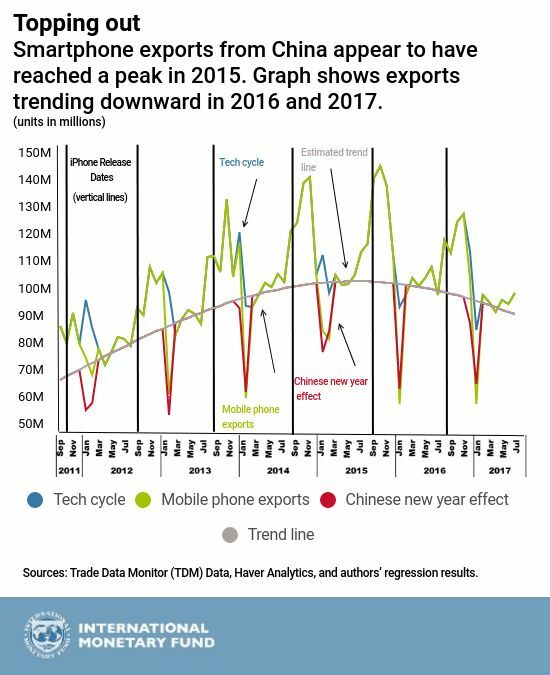 Similarly, at the peak of the cycle, components for smartphone production accounted for more than a third of total exports from Taiwan Province of China, 15 percent of exports from Singapore and South Korea, and 11 percent from Malaysia. Data on value added by the new tech cycle is not readily available. 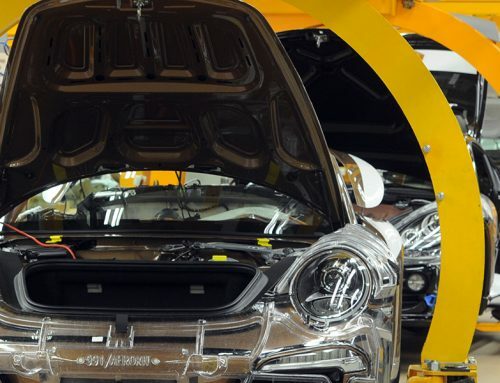 However, OECD data on value added to GDP by the computer, electronics, and optical sectors indicates the magnitudes involved. In South Korea, computer, electronics, and optical sectors accounted for 7.4 percent of total value added in 2013. In 2012, the ratio in Japan was 2.1 percent, and in Ireland, 2.0 percent. The percentages probably increased substantially in years since, reflecting the new tech cycle. Demand for smartphones is highly cyclical and related to the release of new models. 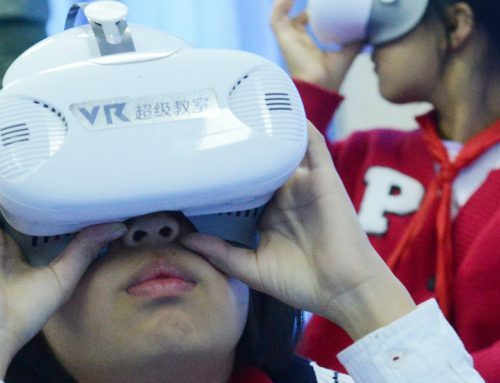 Thus, production and trade in several Asian countries have become highly correlated, shaping a new tech cycle that differs from the earlier tech cycle associated with PCs. In our paper, we show that the new tech cycle cannot be captured by standard seasonality. Instead, it depends on the release dates of Apple Inc. iPhones. The cycle can be subdivided into two components. The first is the pre-release cycle, with the export of components from several Asian countries to China, the producer of most smartphones. The second is the post-release cycle, with shipments of smartphones from China to the rest of the world. Both pre- and post-release cycles have a strong impact on growth and trade patterns in Asia and beyond. Apple’s iPhone releases are the key determinant of the new tech cycle. 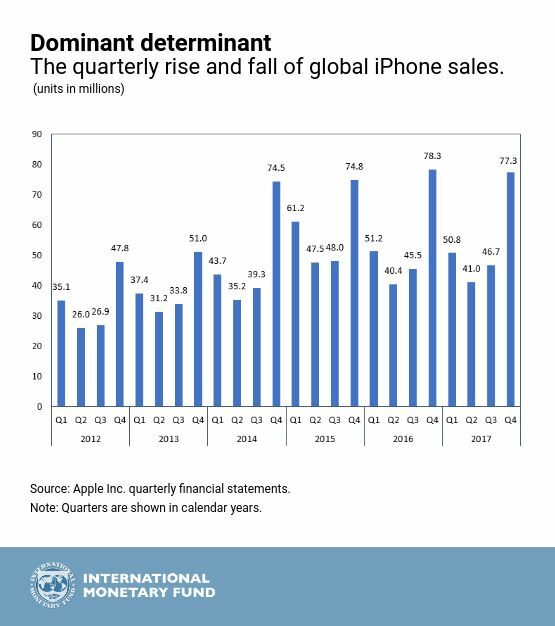 Reflecting booming global demand, iPhone sales surged from 35.1 million units in the first quarter of 2012 to 78.3 million in the fourth quarter of 2016. 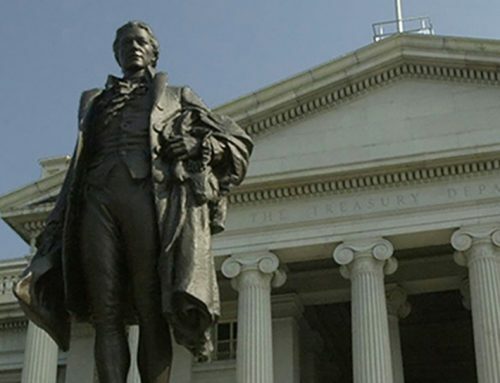 A clear quarterly pattern is emerging in which second- and third-quarter sales are usually weaker, reflecting expectations of another release in the fourth quarter. The amplitude of this pattern has been established only since the September 2014 release of the iPhone 6/6 Plus. There are clear spillovers from the fourth quarter into the first quarter, ahead of the Chinese New Year. Our analysis suggests that this new tech cycle may have peaked in late 2015 and reached a high point in September 2015. We take into account production declines during the annual 15-day factory shutdowns for Chinese New Year. 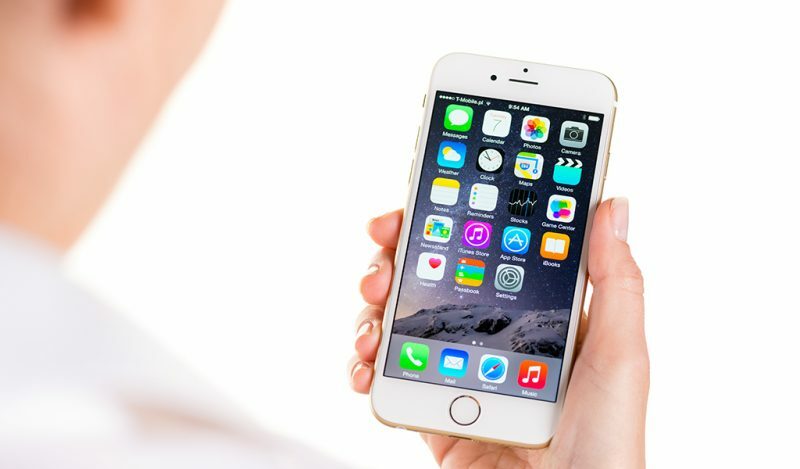 China’s domestic smartphone market declined in 2017 for the first time, and Apple recorded a year-on-year decrease in iPhone sales in the fourth quarter of 2017. While the industry is still projecting increases in unit sales, our analysis suggests that smartphone makers may have to count on price increases to support continued revenue growth. At the same time, Asia continues to gain market share in other, growing consumer electronics devices, including embedded automobile computers, smart appliances, and wearable devices. Trend demand for South Korea semiconductor exports continues to accelerate, despite the slowdown in global smartphone sales. The underlying trend in electronic export orders also remains strong in Taiwan Province of China. This tech cycle based on smartphone production has become an important new driver of the global economy. While we find that the global market for smartphones may have become saturated, demand for other electronics continues to boost semiconductor production in Asia.